« Happy (Early) Birthday, Kir! I’m still slogging along on Tempest (I’ll update that in another day or two), but I got inspired last week to play with something new. Amanda and I went down to Fibre Space on Nov. 5 for the preview party for Olga‘s new book Ori Ami Knits. 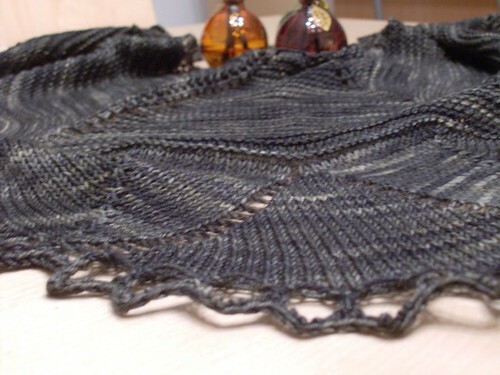 I knit one of the samples for it, and it was lovely to see how it all came together. It’s a really beautiful collection, and I can’t wait to get my copy of it. I cast on last Sunday (the 15th), and worked on it while we were watching “Up” with our friends Mary and Rich. I worked on it at auditions for PGLT’s upcoming production of “Arsenic and Old Lace” (Kris was cast as Mortimer, the role Cary Grant played in the movie, but I wasn’t cast. I’m pretty upset, but dealing. ), and at trivia on Wednesday (We won!). I cast on on Friday, and blocked it yesterday. 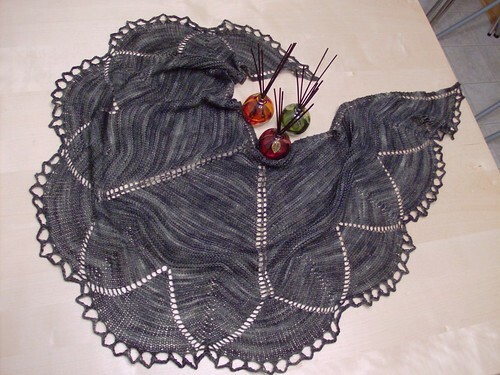 If you are looking for a nice small shawl pattern, I’d definitely recommend this. There’s a reason that it’s so popular. I also got a little something new that I broke in on Damson. I’m a complete sucker for project bags, as anyone who has seen my craft room can attest. Corrina (PicnicKnits) tweeted that a friend of hers had re-opened her Etsy shop. I resisted until Bezzie replied that the “Silverfly” bag reminded her of me. I peeked. I was sunk. So, this arrived from ComeToSilver just in time to house my Damson-in-progess. It’s lovely embroidered satin, has a snap pocket on the exterior, a strap that snaps so you can attach it to another bag or a belt loop, and look at the inside. 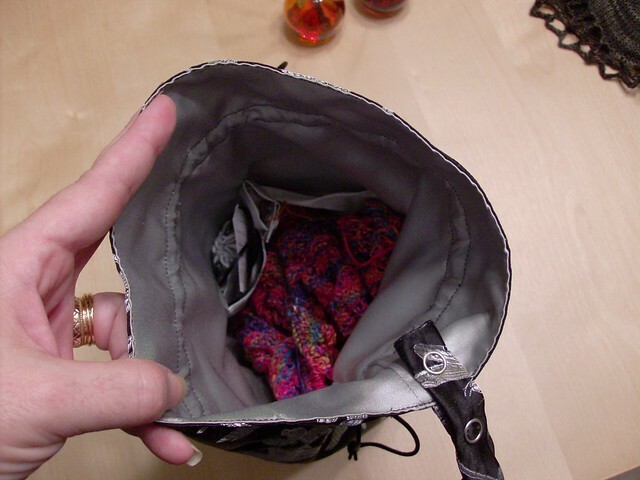 Two interior side pockets, a drawstring notions bag, a snap loop yarn guide. 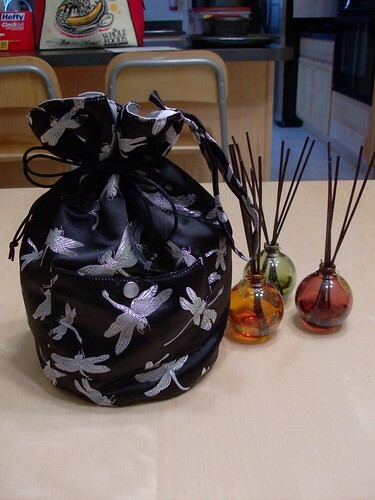 She also included a little sachet of moth-repellent herbs, too. Oh, and yes, that’s a new project in there. You’ll get the details on that another day. November 24th, 2009 | Category: Misc. That is gorgeous. And the project bag is so cool. Good choice! I’ve been eyeing that pattern myself and now I find it even harder to resist. It’s lovely. The bag is really nice, too. Temptation! I love it. Great job? I am also loving the bag? I love the silver-gray kick you appear to be on! Oh wow! That’s so pretty! 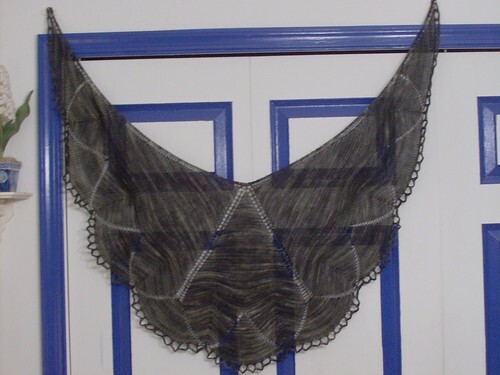 You’re a shawl machine! What a beautiful pattern, and great color. Bravo!